Update: 24 Sept 2011: I've since switched to using a MacBook Pro as my main computer - and despite previously thinking that the ThinkPad Keyboard was the world's best computer keyboard - I think the MacBook Pro backlit keyboard on my early 2011 MBP is simply the best keyboard I've ever used. The mini Mac keyboard is nearly as good - just a shame they don't make a backlit USB version (only bluetooth now). For a couple of years now - on and off, I've been trying to find the perfect small form factor mini size keyboard. Like David Bau in his own quest to find the World's Best Computer Keyboard, I came to the conclusion that I really don't want a full length, full size, 101 to 104 key keyboard on my desk. I rarely use the number pad, and when I do - I don't mind it being separate. I want my posture to be straight when I'm using my computer - from my back, to my shoulders, to my arms, wrists and hands. I found that when I was using a full size keyboard with a built-in number pad on the right, that the extra length on the right side of the keyboard was causing me to reach just a few inches further than I wanted to in order to use my mouse; just enough to change my posture - and enough for me to feel it in my shoulders and wrist when using my mouse. So that started the search... and man did I search. I tried a bunch - including an expensive Cherry POS keyboard as well as the ThinkPad Travel UltraNav, but they were all far from perfect. The UltraNav in particular was a disappointment (it's up there in my little keyboard mountain) since it was nothing like the real ThinkPad keyboard in my notebook; the quality, key action and feel was very different. I don't understand why PC users have such a poor choice in desktop keyboards. If you took the average manufacturer's PC desktop keyboard and tried to put it into a notebook, the notebook wouldn't sell. In fact it was while using my notebook that I realized my posture was better. Not only that but the keyboard in my notebook was so much better than my desktop - it was the famous IBM ThinkPad keyboard - the benchmark in notebook keyboards. For a while I was using a Deck Legend - and I loved the key backlighting, but this was before my quest for a smaller keyboard. I actually contacted TG3 - the manufacturer of the Deck Legend, hoping that they might be about to update one of their current small form factor models, or possibly modify a BL82 for me into the standard Windows keyboard layout. I was prepared to pay. My keyboard is a tool I use for work, just like a tool any other professional would use in their job. The first thing you'll discover when you start looking for small form factor keyboards is that there's a variety of different keyboard layouts. That was the first big stumbling block. I'm a CTRL-S freak. I hit CTRL-S for nearly every line I write, code or otherwise - so having the CTRL key in the usual position - bottom left - is important (although I confess I've 'adapted' when using my ThinkPad, which has a function key in the bottom left position - but that's my only complaint with the ThinkPad). The standard CTRL-Windows-ALT arrangement bottom left would be great, followed by, from the top right, down the right side - DELETE, HOME, PG-UP, PG-DN, END, and then the arrow keys. This is the layout used by most notebook manufacturers these days and it would be good to have a matching desktop and notebook keyboard. The HP 8150W (shown) has a good keyboard - although I whish they'd put the Function key to the right of the spacebar. The other thing you'll discover when looking for a keyboard of any size - is that most of the models advertised online don't have a good quality larger version picture of the keyboard. It was pretty hard to figure out how the keys (especially top row keys) were arranged before shortlisting a keyboard for purchase. 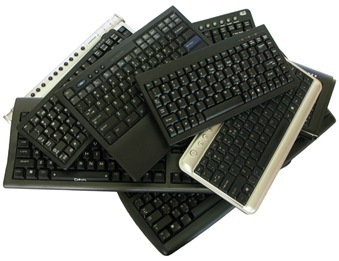 I've also looked at the growing number of media keyboards that are slowly coming onto the market. The growth in home media centers means that more people are now actually looking for smaller (and wireless) keyboards - but again - quality, keyboard layout and in particular function keys vary a lot. I've looked at the Logitech diNovo Edge - which is just a fraction wide, and the key action wasn't quite what I was looking for - but it was close. Also the Microsoft Wireless Entertainment Desktop 8000 - another close call - but again, a little wide and poor function key support since the function keys are in a flat membrane key strip across the top. My current keyboard (and mouse) is the Kensington Slimblade Media Notebook Set. So very very close. The layout is almost perfect. I wish the function keys were full-size - but they work. Key action is superb and the closest so far I've come to feeling like I'm on a ThinkPad. The right side key arrangement is a little odd - with END at the top-right - followed by PG-UP, PG-DN, INSERT, DELETE and then the arrow keys. It's taken me a little while to get used to the DELETE key in this position. Still - this is the closest I've come to finding the perfect small form factor keyboard. Kensington have always made good quality accessories. Want to know why? Well I think it's because they make accessories for the Macintosh as well. And Mac users, having become accustomed to brilliant design and ergonomics, wouldn't tolerate a low quality accessory (in fact I popped into a local i-Studio Mac shop recently and saw a brushed aluminum small form factor keyboard that was just lovely). So what would my dream small form factor keyboard look like? It would be matt-black brushed aluminum, use the keyboard layout shown in the HP8150W keyboard above - but with full size function keys. It would have illuminated keyboard characters (blue back-lit LEDs) and would totally rock in terms of quality and keyboard action. Until then... my Slimblade will do nicely. I may even give the IBM SpaceSaver II a try (as mentioned in David Bau's article) if I can find one. While searching - I came across these two very expensive honorable mentions... The Optimus Maximums from Art.Lebedev Studio. This is an incredible keyboard - would love to put my hands on one, and if they ever make a smaller version with a separate number pad - I'll buy it. And then there's Datamancer - not sure whether to be scared, or in love with this stuff. Maybe when I'm wealthy, one day - I'll ask this guy to make me a keyboard (the equivalent of American Chopper for geeks - so cool). I just switched from my Thinkpad r40 to a desktop computer to have a bigger screen but the keyboard turns out to be a huge issue. Now that I don't have it anymore I realize just how damn good the r40 keyboard was. Yup, the ThinkPad keyboards really are the best notebook keyboards. I had sort of wondered though if they were going to change their layout to the HP key arrangement with the wider T60 series. Function key location is still a little irritating. I also have an IBM SpaceSaver II on the way. And you might like to check this out... Luxeed LED Keyboard, looks like the perfect layout - but don't know how it feels yet. Have you seen the DataHand ... http://www.datahand.com/ Now that is a different approach to the keyboard problem!!! I feel exactly as you do. The standard keyboard are a shamefull waste of desk space. For years, I've been using a wireless (IR) mini and I love it. I buy the Fentek (www.fentek-ind.com) #KBMWB. It has an acceptable feel and the keys are all in the standard positions except the Delete key is in the lower right, inboard of the arrow buttons. I actually prefer this delete key location. (No function key on the right side of the spacebar.) I stay away from the RF wireless keyboards as I find they sometimes have intermittant performance. I'm looking for a replacement for my Lite-On Wireless Surfboard and came across your site hoping to find something close, but so far I haven't found one. Here's a pic of it. http://www.flickr.com/photos/philmo/3651421709/ Its features include a smaller footprint due to the lack of the numeric keypad, a bunch of hotkeys which no longer work because the software, which is on a floppy, was designed for WIN95, the hand grips on the back and the features which make it the only keyboard of it's kind, the thumb enabled joystick, left and right buttons and the locking drag and drop button that takes the place of the mouse. Not only are you not locked to your desk, but you're free from your mouse as well, so you are really free. I can sit back in my chair with my feet up and do anything on my desktop with this board and would love to find a new one, but haven't had any luck so far. Would you be able to offer up some suggestions for its replacement. Thanks, Phil in K.C.